Clocks and calendars are standardized ways to mark time but we all have dozens of other measures of its passage, like noting the diminishing hours of daylight in the fall and the appearance of more gray hairs on our heads. While pacing my patience in Ulcinj, Montenegro as my shoulder healed from a presumed partial dislocation, my attention turned to less-usual ways of monitoring the passing hours and days. Unexpectedly, I could easily measure time with the improvements in my shoulder's functioning. Usually recovery processes, like from a cold or a knee injury, have vague and imprecise healing stages. "How are you doing?" is likely to prompt a "I think I'm a little bit better" or "I'm not sure." And with these recoveries, the point at which one finally feels well isn't noticed in the moment but is usually only recognized in hindsight. There was no such vagueness or ambiguity as my damaged connective tissue and muscles healed and the inflammation subsided. In the first hours after the backwards fall uphill onto wet pavement I was readily able to report when the acute pain abated to a persistent dull ache. That evening I could easily tell when the need to be motionless and propped up by pillows was gone and I was ready to move around a bit--and then wonder when my dinner would be ready. My shoulder was noticeably better every 12 hours for 2 weeks and every day I could specifically describe how it had improved from the evening or morning before. What was startling and discouraging however was how much progress it could make and yet it was clearly a long way from being well. I had hoped to be functioning at about 75% in 3 days but my body had no trouble convincing me that I'd only progressed a few levels up a long flight of stairs on my healing journey by that time. I needed to poise myself for a long climb up out of a hole and being fascinated by the process would help. Pressing an earring back onto a stud was one of the first performance standards that presented itself. Amazingly, in the first hours after the injury, that task was too painful to complete--the 2 parts spent the night separated on the nightstand--something they never do. The next day, with great care, I was able to transfer the needed force through my left arm for separating and connecting earring parts. The night of the injury, pulling my shirts overhead wasn't an option--Bill had to ever-so-carefully help me. Going from being dressed to dressing myself was a milestone quickly achieved; but being able to dress myself without becoming mildly nauseous took about a week. That big rotation of the shoulder when the arm is held overhead to pull a close-fitting T-shirt on or off was the challenge. I could do it but the wave of illness that passed through my brain and body was at the limit of what I'd willingly trigger myself. Moving my elbow behind me to pull my pants up was a motion that also took careful consideration and I braced against the pain as I then buttoned them in front. Like with pulling shirts on and off, this normal activity also required a little rest afterwards. Once the risk of feeling ill with dressing ceased, watching a less-guarded robustness gradually creep into to my dressing gestures was reassuring. Soon, I'd be able to do the motions mindlessly as I had done for most of my life, though not without some residual sensations. As the days went by, each of these maneuvers became increasingly possible, increasingly comfortable. Despite my successes, there was no shortage of ways to measure the passage of time, to measure my day-by-day progress. Light switches, door handles, and the toilet lever gave me clear-cut, instant feedback multiple times a day as to how my shoulder was improving. First it was regaining my ability to do the activity at all; then I noted the diminishing amount of care and calculation it required; and the big jump up in functioning was when I was no longer limited to a single shoulder position to complete the task. Hand washing was a sensitive measure of healing for about 10 days. Initially, washing my hands was barely possible. For days the back of my left hand had to rest against the sink while the right hand carefully did all the required pressing, swirling, and rotating. Gradually the left hand ventured out away from the stability of the sink edge to passively be washed by the right hand in neutral territory, in the center of the sink. There was a slow build-up from that point over the coming days as the left hand gradually became more active in this compound movement that required the lateral pressure that was so painful to the arm. Even at the 2 week point, this task required mindfulness as reverting to 'auto-pilot' could be too jarring; at 3 weeks, I still experienced discomfort with the activity. These "activities of daily living" as professionals describe them, gave me a steady stream of indicators as to my shoulder's progress and the passing days. The successes and challenges were different everyday and everyday my gains spurred me to try abandoned activities; scary tasks like emptying cooking pot water into the sink. Lifting, reaching, slicing, pouring, scrubbing, opening, closing, tossing--those were all motions that had to carefully be tested for improving competency on a daily basis. I laughed as I repeatedly heard the mantra in my head of a friend back home who was recovering from shoulder surgery: "Hi...nice to see you...don't touch the shoulder." Yes, every time Bill or a stranger got within about 3' of my left side "Don't touch the shoulder" popped into mind if not out of my mouth. It wasn't until Day 10 that my phobia of being unexpectedly touched on the left side softened. The little jerk from closing a zip-lock bag on about the third day had made me shriek--I dreaded the thought of what would happen if someone bumped me. If the pain hadn't been enough to tell me that my partially dislocated shoulder was an injury to be taken seriously, my training and that of Bill's reinforced it. A complete dislocation usually results in permanent damage to the joint, damage that makes the joint more susceptible to re-injury. We'd never know where on that continuum of almost/partial/complete dislocation my injury ranked, but caution was warranted. Especially given that I nearly passed out from the pain that is so typical of this injury, I dearly wanted to prevent a recurrence. For me, a recurrence would most likely be triggered by a fall when hiking or biking and it wouldn't be a pretty picture if that happened miles from nowhere. Unfortunately the healing process put me at risk for a subsequent, equally problematic injury, a frozen shoulder. Too much activity before it was healed would increase my risk for a lifelong vulnerability to dislocation; too little activity early on and I could have a painful, perhaps persistent, restricted mobility in my shoulder. I reconciled the conflict between the hazards of too little and too much activity by listening very carefully to the pain and the solicited advice of others. I would press a bit, but not through great resistance. I would tolerate the distress of the 'sicky' feelings that using the joint triggered but would not escalate the never-ending dull ache to the level of sharp pain. I knew if I didn't manage my healing process correctly, 6 months from now pressing past those pain 'gates' would be appropriate to break-up limiting scar tissue, but not now. I regulated my activity based on the pain level, not what I wanted to do, not what I thought I should be able to do given the passage of time. Watching the spring colors emerge from our balcony. As the days slipped by, "time passing by" clichés drifted through my head. On the rainy days when lunch was taken indoors instead of on our little balcony, it seemed like we were on the deck of a big ship at sea. There we sat, side-by-side in upright lawn chairs, munching our tuna-filled rolls as we stared out at the sea and sky past the railing top. All that was missing was a rocking motion to think that we were on a quiet trans-Atlantic voyage. Then there were the images of the changing of the seasons--an image that played-off of the endless-aspect of this patient waiting game. Kind of like watching the corn grow.... On one hand, it was seeming like an infinite journey, on the other hand there were twice-daily improvements in my range of motion that reinforced that it was a very active healing process. On the evening of Day 8 I had an inkling that soon, perhaps in 2 days, that there would be a bounding leap up this staircase of healing instead of the usual few steps. I'd noticed that I was now doing complex and challenging motions, like pouring water out of a pot, without thinking about it. The "Careful!" messages that had accompanied almost every gesture for 8 days were dropping away. I was stunned when just the next morning I was significantly better, I had shifted from feeling acutely ill to chronically ill. Not that I wanted to settle for chronic but it felt like I'd been released from Intensive Care on to the wards. As Day 9 progressed, I felt so much better that I proposed we move my test ride up to the next day. Then we could better judge how close I was to being roadworthy, to being able to resume our active traveling life. The chaos in my shoulder and left upper arm the first minutes of Day 10's test ride just about sent me back to my room. The steady pressure of my left hand on the handlebars created uproar in all those jangled and injured muscles and tissues--it was like an eggbeater whirling the sensations around. It wasn't the dreaded jerk or bump creating the chaos--it was only steady pressure that was so poorly received. It was like all of those muscles had lost their cue cards, that none of the internal actors knew what to do when the curtain went up and they were all running around bumping into each other. At my request, we stopped every few minutes during the beginning of this first unloaded test ride. I knew from years of experience that a sudden strong exertion, like starting cold on a very steep hill, could throw my whole body into chaos and that a rest in the first 1 to 2 minutes always paid huge dividends. I hoped this trick learned from my legs of immediately resting after the initiation of harsh effort would transfer to my injured shoulder. Luckily it did. After about 25 minutes of riding interspersed with multiple long rests, all of the noise in my shoulder completely settled down. A professional with whom I'd consulted by e-mail had said that "The muscles will quickly regain the memory of holding you up on the bike" and he was right, they did. Not that any of those muscles wanted to remember, but when pressed, they fessed-up that they knew what to do and could do it. We managed to have a delightful ride on the flat course Bill selected and in the end, I think the ride actually accelerated my recovery because the muscles were forced to function more normally. 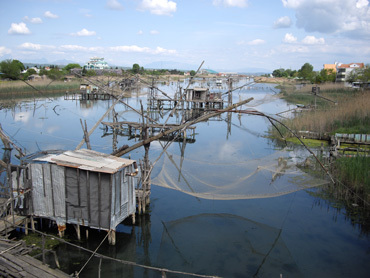 We spotted these fishing nets in a canal during our bike ride. I felt like I'd been liberated from detention on this test ride. For my 9 healing days and the 2 days before, I'd seen nothing but the town of Ulcinj. I couldn't ride my bike and there wasn't any place to go to by bus, so I walked and walked some more. Getting out of town and seeing different scenery buoyed my spirits immensely--I was back doing what I loved. As the 2 week anniversary of my injury approached, it was the clear that the movements behind my back, either close to my body or off to the side, were the last enclaves of the lost range of motion. Back where I couldn't see; back where the right hand couldn't help much; back where it was harder to evaluate angles and rotations; that was the place of the more vague healing journey with uncertain end points. In that hidden range behind my back it was less clear that triggering distress and discomfort was productive. "Back there" it was tempting to say "This is good enough....it will do fine without my help." But I knew better. I knew that it was just such bullying and boundary setting by the injured body that would lead to permanent disability, permanent loss of range of motion if I didn't insist upon its return. This is where my recovery process would slip into the familiar model of vague and indistinct progress in which the final bit of healing would only be noticed in hindsight. Our intentional layover in Ulcinj that became a forced layover was in a small way a dream-come-true--it was bonus time--time to catch-up on a long list of things that rarely make it on to the "A" list. I spent the first 9 days completing non-trip files I'd started for the webpage. In the first few days I'd envisioned completing all but the last 3, and then whoosh, they were done too. The files dating back to 2004 ticked off the list at a rate of about 1 day. After that totally unexpected task was behind me, I was on to other historically "C" list items. Bill astounded himself twice: once with the length of his potential chore list and a second time with the number of chores he completed as the passing days became weeks. His was a more varied mix of chores than mine, with a little bike maintenance, a little hand sewing, a lot of route planning, and a hodge-podge of unrelated computer tasks. His computer chore list is never-ending and 2 new and troublesome software updates added to his woes while he was working on other old problems. This protracted healing journey of mine also created an opportunity for our newest major gear acquisition, "Little Brother," to shine. Being nearly house-bound for almost 2 weeks by unleashing the press of old chores made that second laptop a real boon. Given the webpage and our emails are still best accessed from the primary computer "Baby" it was still take-a-number time to use her. But Little Brother's growing library of electronic guide books and his equally effective ability to access the internet for surfing meant that he got plenty of attention too. And he was looking all the more important the day that Baby had a little glitch and took her sweet time in turning her lights on. 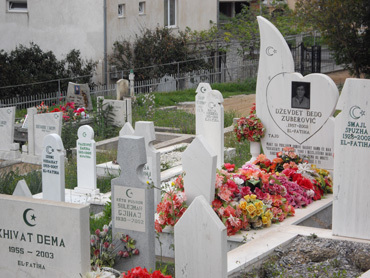 Comparing the Muslim and Orthodox cemeteries on my walks. In addition to "de-archiving" neglected webpage files, one of my chores was to maintain my fitness level while my shoulder healed. I had just nicely retrieved my flagging conditioning when I hurt my shoulder and hated to see it wane again. It takes about 10 days for me to recondition and it has its discomforts along the way. Retaining my CV fitness and my leg strength by walking while we had a 3-day chore layover in Ulcinj for Bill was how I hurt my shoulder, but the injury wasn't a reason to stop exercising. I slipped on a steep street and it was back to that street and others for my daily walks of 2 to 3 hours the morning after my fall. My walks offered their own measures of the passage of time and of my healing. I did a fair-bit of guarding of my shoulder on the first day's walks. The "broken wing pose" was something I was to avoid as it is a veiled form of immobilization which would threaten the complete return of my range of motion. But I allowed such guarding during rest periods while at the computer and initially on my walks. On my first walks I made no attempt to be discrete as I'd walk with my forearm and palm resting diagonally across my chest to minimize the motion in my shoulder. Sometimes I'd support it with my right hand, other times not. As my shoulder felt less vulnerable, I became more casual about supporting it by stuffing my hands in my pants pockets as I walked. With each passing day, my left arm was allowed to hang free for increasing amounts of time as I tromped around Ulcinj. Gradually my arm allowed itself to begin swinging normally in response to my gait. 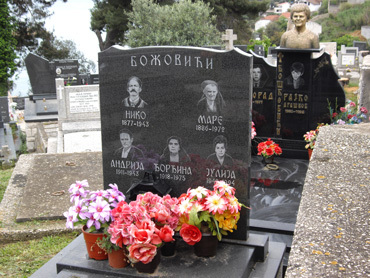 The Orthodox cemetery had a decidedly eastern flair. It wasn't until into the second week that I tried carrying much weight with my left arm. Each morning's walk finished with a stop at the market so I had a ready supply of calibrated weights with which to challenge my arm. The 300g box of frozen cherries for the next day's breakfast was less than a pound, a 500g bag of pasta was a little over a pound, and I was usually successful in secretively weighing our lunch bread in the store each day so I could also use it to precisely select a little heavier load for my left arm when I wanted to. I didn't carry very much for very long but toting the groceries at the end of each morning's walk provided yet another way to mark the passage of time with the healing of my shoulder tissues. I had 2 goals for my daily fitness walks, which were usually split equally between late morning and late afternoon outings. The first goal was to walk for a total of at least 2 hours; the second objective was to hoof up and down 400m a day, that's about 1300'. For those of you in Portland, walking from the waterfront to the top of Council Crest is about 1000'. The first healing days I only made mental note of each day's elevation gain, but by Day 5, it was time to start writing it down. I had expected to be pretty well recovered by then but I could see the handwriting on the wall. Computing my weekly gain was interesting but I cringed at the thought of being in Ulcinj long enough to compare 2 week's numbers. Then I looked for more ways to mark the time. Measuring my heart rate at the highest point of my walks was yet another measure I could make. Then I considered timing myself on the longer stretches of climbing up the outdoor stairs and streets though never quite got organized to do that. 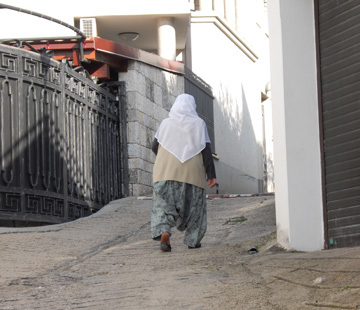 I followed her to find a new through-route in a residential area. By Day 6 I started getting bored. I was still patient with my shoulder's the rate of healing and I had re-energized myself for working on my writing projects; it was my exercise routine that was becoming too tedious. I had 2 walking routes on which I could rack-up 250-300' in gain but the other 1000' I targeted for each day came either from repeating those or doing laps on routes more in the 100' gain range. Back-and-forth, up-and-down I went on my 2 walks of at least an hour each. Sometimes I'd give a route a rest not so much because I was bored with it but out of consideration for the neighbors. All of these routes, even on public streets, had me practically on the patios of the homes and people did stare. I imagined the stories behind the odd looks: "Who is that strange lady in the funny hat? Why does she keep going by here? What is she doing? Why doesn't she go somewhere else?" Every few days I'd find a new flight of outdoor stairs or a new little connecting path to add a little variety to my routine. This route weariness reminded me why I love cyclotouring: I am committed to vigorous daily exercise and yet I easily became bored with routines. As the number of days spent in Ulcinj added up, most of the things we were monitoring were increasing in quantity. The mobility in my arm was noticeably greater every morning and night. I was accumulating elevation gain on my walks and more slowly, adding more weight to the bundles that my injured arm carried on my outings. Both Bill and I were adding items to the "Completed" column on our respective chores lists. But an unexpected measure of time while my shoulder healed in Ulcinj was a measure of depletion--the depletion of certain food items from the 3 largest food markets in this town of 11,000. Unlike the markets in the US which usually completely restock their shelves overnight and are replenishing some items during the day, in southern Europe the process seems to be measured in weeks, not days or hours. I'd seen it many times when we stayed in a single town for a few days: if I took the last item off the shelf, I wouldn't see it again before we left. It's unimaginable to me why it's that way but I know it is true. And we saw it immediately in Ulcinj. First it was the canned beans that we depleted--probably an item leftover from last season's tourist trade given the small supply on the shelves. Next, we cleared out all of the better tuna from the shelves of 1 store and Bill nabbed the readily available half-dozen cans from the next store to give us a buffer. 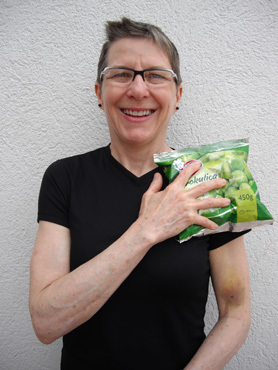 "Frozen veggies to the rescue!" On the first of my twice daily walks I'd swing by the nearest market for bread for lunch and frozen Brussels sprouts. The tender little 'b-sprouts' were a good substitute for our preferred broccoli that wasn't available and every day I used the nearly 2 lbs of frozen veggies to ice my shoulder. The day came however when I pulled the last of the b-sprouts out of the freezer compartment and it was on to the next store to keep us supplied. By Day 10 we'd cleaned-out the town's inventory of frozen Brussels sprouts but we were in luck: on my test bike ride day we found a 4th market on the outskirts of town and it had just enough bags of the little guys in its freezer to see us through our stay. By the time we left Ulcinj, we'd systematically decimated the town's supply of canned beans, Calvo tuna in olive oil, frozen Brussels sprouts, and the better chocolate bar and muesli that were available. Watching the inventories of a given store gradually run down and then having to move on to the next market was an unexpected way to measure the duration of my healing process. Like the marginal plumbing in our apartment, we hoped the groceries in the stores would hold out until we left town. Luckily for us the delicious, inexpensive frozen cherries that perked up our morning muesli were in good supply. I depleted the nearest store's stash, but the others were well stocked. We were at no risk of going hungry of course as other current staples of ours, like fresh garlic, tomatoes, and pasta, were readily available. Bill was very attentive to my injury, beginning with a careful assessment in the first minutes to establish the nature and extent of the damage. He supplemented his own knowledge with that that was available on the internet to rule-out a collar bone fracture, other fractures, and possible nerve damage. "Squeeze my fingers; does this hurt?" were reassuring questions to be answered as we came to terms with what had happened. Like me, Bill was alternating pleased with how well I was doing given our perception of the seriousness of the injury and disappointed that I wasn't recovering more quickly. His sense of time about this injury jerked into a new position on Day 7. Suddenly he became concerned. He was no longer satisfied with the healing time line. He now shifted onto his own new set of decision criteria: "How long was long enough to wait?" He began wrestling with his new uncertainty about the passage of time. His questions became "How long to wait until we sought a professional evaluation in another country and what country should that be?" Fortunately it was only about 36 hours after his alarm-bells started going off that I sensed that my healing was about to catapult forward, which it did. My slow-starting but ultimately successful test ride on Day 10 was enough to quiet his concerns that he'd missed something in the diagnosis. He was able to set aside his potential task of selecting the point in my healing at which "It's been too long." Spiffing-up the beach promenade street lights for summer. 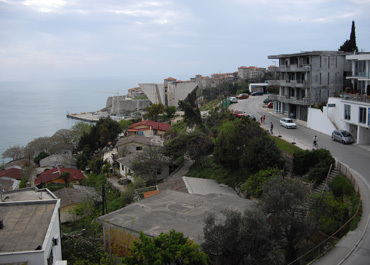 Watching the changing look of Ulcinj from our apartment window and while on my walks also reminded me of the passage of time--time that started feeling like months instead of the days that it was while my shoulder healed. Marking seasonal changes can make the passing time feel longer than it really is, but we were in Ulcinj at a time of rapid change. It was that 'spring-thing' that was happening. When we arrived in Ulcinj on the 11th of April, little more than my itchy nose and eyes suggested that spring was happening. I kept looking around for markers for my hay fever season, but they weren't in sight. But as my shoulder continued on its steady, plodding course of healing, spring decided to jump onto the scene in a reckless way. Easter lilies started unfolding, the wisteria was out in full force, and the bare-vined arbor over the neighbor's balcony seemingly leafed out overnight. Bill commented one day from our balcony that everything below was greener than when we arrived. The Mediterranean doesn't do spring-green in a vibrant showy way like Portland does where one can readily count a dozen or more shades of green before you; where the bulbs and perennials put on a splashy show of color before the days reliably warm. But the Med's quieter version of spring does show through as the grays and browns of winter become framed by streaks and patches of green and sweet scents catch the attention of your nose. 2 sail boats and a larger craft showed up in our bay. Ulcinj is a beach resort town and though our hostess wouldn't see her first bus loads of Hungarian tourists until June 1, the town was getting ready to meet its public. When we arrived, we seemed to be about the only non-Balkan tourists in town. Yes, there were plenty of license plates from Albania, but hey, Albania was only 10 miles away. But by our second week, it started to shift. I was stopped by a Dutch woman who had gotten turned around and the couple whom I offered to photo declined in first-language English. One day I spotted a car from Austria and 2 days later it was our first "caravan" or RV sighting from Germany. Yes, yes, these were sure signs that the tourists were slowly making their way south for the season. We suspected it was those Germanic visitors with whom we had unsuccessfully competed for muesli in the markets. 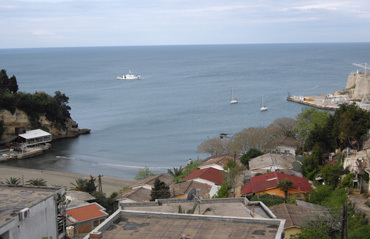 And just before we left Ulcinj, the first pleasure craft made an appearance in our bay one morning. 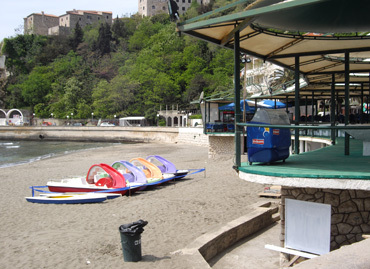 Ulcinj's tourist infrastructure slowly unfolded from its winter hibernation as my healing days piled up. The green wooden decking was applied to the raised bar alongside the beach and the plastic paddle boats appeared from hiding beneath the structure. The waiter at the promenade cafe was now available to serve drive-up ice cream cones for those who knew to ask. With each passing day, more and more of the still-closed bars and disco's had work crews out repairing and reassembling canopies and serving areas. None of them were opening, but they were getting ready. The paddle boats and new green decking appeared one day. The householders were marking spring by washing area rugs. Some days it seemed that everyone's rugs must have been hanging from balconies and metal frames. Women hosed and scrubbed them on the narrow streets and the few passing cars respected the ritual by slowly driving around them. The successful test ride on Day 10 abruptly signaled that the open-ended waiting period was over. Suddenly endless time became compressed time--projects had to be wrapped up and chores had to be reprioritized as we'd be on the road in 2 days. We'd give my shoulder another rest day--a day to register any final protests from the test ride--and then we'd bike back to Bar and from there we'd take a train into Montenegro's interior. We alternated biking and hiking days for about a week to coax my shoulder along in its recovery process but it still wasn't happy. The dull ache persisted as did its demands for frequent rest stops on the road. Clearly the rapid and distinct healing phase was behind me and we expected this second phase, the slow healing phase, to last for weeks if not months. I'm disappointed but not surprised to still be struggling with this slow healing phase of my recovery. I am weary from the constant, low-grade discomfort but know it can be much worse than what I am experiencing. Seven weeks on and I still ice it daily as well as challenge my shoulder with strength building and range-of-motion exercises. My arm and shoulder function well during the day with the lifting, toting, and biking motions that come its way with our traveling lifestyle. Oddly, washing and applying sunscreen to the opposite arm is more distressing than most of what happens on the bike. And it is still the movements behind my back that make me turn green from the flood of unhappy sensations as I nudge the shoulder to let the arm travel where it once went willingly. My greatest challenge however is when sleeping. It seems to be the stillness and pressures of being in bed that puts a cascade of muscles into spasm each night. Bill massages out the knots and tensions in my greater shoulder area every night before bed and on the worst nights, he interrupts his sleep to release a new muscle spasm in my shoulder so I can rest. I usually arise 2 or 3 times a night to massage or stretch the protesting muscles in my arm, shoulder or back. Bill recently spent several hours reading online to learn more about my current healing stage. The torn and damaged tissues are likely mostly healed at this point and the discomfort is instead coming from the miscuing caused by changes in my brain lagging behind the tissues in the healing process. Bill bought a ball to help with my shoulder rehab. The brain has a precise map of the highly mobile shoulder joint and strict criteria as to which positions are safe and unsafe for the shoulder. Even when 100% healed, my internal shoulder topography will have changed forever because of the injury. Bill refers to it as my "new shoulder." Unfortunately, my brain's map is of my "old shoulder" and so sometimes when my new shoulder is in a safe and desirable location my brain registers the positioning information from the shoulder nerves as potentially dangerous and it signals the muscles to contract to protect the joint from injury, hence the spasms. So as the tissue healing wanes, reprogramming my body's "proprioception," or spatial awareness and responses of my shoulder, is the main challenge. I often say "I am right for the wrong reason" and once again it has proven true. Some of the activities I reinstated within days of my injury to keep the healthy areas of my body healthy were unknowingly perfect for reprogramming the proprioception in my injured shoulder. The day after my injury I was back doing my kicking exercises that require balancing on 1 leg and a few days later I was doing a modified version of my daily headstand. Curiously, even though the focus of both of these exercises involving balance is far removed from the shoulder, the generic balance challenge apparently has been helping to rewire my shoulder's proprioception for the last 7 weeks. This new information about the need to update my shoulder's proprioception is very comforting. The bad news is that this is a slow process; the good news is that we now understand the issues around this phase of healing and we can further refine our treatment plan to support this additional process. The more we learn about this injury, the more optimistic we are that I will have a full recovery and the less concerned we are about my risk of re-injury. Now the challenge is to be patient with this slow healing phase and to remain disciplined about doing the physical therapy regimes to achieve the 100% recovery that I expect. Bouncing my new pink ball has added some fun to the otherwise tedious work. We are along the coast of northwestern Italy doing our best to navigate around the lodging scarcity caused by Pentecost, the Republic Day holiday, and the approach of summer. We are almost to France and Monaco and will be in France on the weekend. Once there, we will turn north into the Maritime Alps to explore some new mountain territory. Bill expects us to be in France for about 3 weeks, then we'll make a beeline eastwards by train so as to arrive at our reserved apartment in the Dolomites on July 4th.